We’d love your help. Let us know what’s wrong with this preview of The Secret of God's Son by Usha Narayanan. 'The seas will devour the glorious city of Dwaraka. People will forget your name and your Gita! With this cruel curse on Krishna, Queen Gandhari plunges mankind into the unspeakable evil of the Kali Yuga. It is up to Pradyumna to try and reverse the dire prediction. To journey into terrifying realms, confront Yama and Shiva, and to 'The seas will devour the glorious city of Dwaraka. People will forget your name and your Gita! It is up to Pradyumna to try and reverse the dire prediction. To journey into terrifying realms, confront Yama and Shiva, and to vanquish the Kali demon. And to do so, he must shed all that holds a mortal back-his arrogance, his fears, his baser instincts . . . He must lead his people out of the swirling vortex of greed, disease and misery. To ask other readers questions about The Secret of God's Son, please sign up. I had read Usha Narayanan’s first book in the series called, Pradyumna, Son of Krishna and had been mighty impressed by the same. So, I sat down to read The Secret of God’s Son with great enthusiasm and I must say I wasn’t disappointed. The writing flows comfortably in the author’s perfect language that’s absolutely suitable for the genre she’s written. This is a major plus in the book’s favour. Though my knowledge of Indian mythology is pretty wide, I haven’t read anything much after Lord Krishna I had read Usha Narayanan’s first book in the series called, Pradyumna, Son of Krishna and had been mighty impressed by the same. Though my knowledge of Indian mythology is pretty wide, I haven’t read anything much after Lord Krishna’s death. Usha Narayanan has written a lovely fiction that talks about the state of the world after The Blue Lord passes on. Kudos for that! I am generally a bit weary of sequels, especially if the first book was a smashing hit, because they often fail to live up to their expectations. “The Secret of God’s Son” is the sequel to “Pradyumna – Son of Krishna”, and I have to say it definitely does live up to my expectations. The center around which everything else revolves is Pradyumna, son of Krishna. Once again, upon this hero’s shoulders lies the heavy burden of having to rescue the world. The prologue sets the scene, and it was one of I am generally a bit weary of sequels, especially if the first book was a smashing hit, because they often fail to live up to their expectations. “The Secret of God’s Son” is the sequel to “Pradyumna – Son of Krishna”, and I have to say it definitely does live up to my expectations. The center around which everything else revolves is Pradyumna, son of Krishna. Once again, upon this hero’s shoulders lies the heavy burden of having to rescue the world. The prologue sets the scene, and it was one of my favourite chapters. It made the darkness and despair come to life, and it gave me some background knowledge as I don’t know much about what happened after the Mahabharata conflicts. Although the story is once again loaded with action, violence, drama, emotions and quests, I thoroughly enjoyed the subtext too. Pradyumna asks intriguing questions that allow the author to spice up the tale with some philosophy and religion, some moral and criticism. When he asks Krishna who represents “dharma”, we can take away lessons from that. We also get to look into different people’s heads and hearts, to experience grief and rage, confusion and desire through them. Throughout it all, Pradyumna stands tall despite the outer and inner battles he’s waging. As does Maya, his true love. The author shines a light on the role of women and goddesses, wives and mothers, as she has done it with Book 1, emphasizing that often it is the women who determine how the men will act, that they are just as strong and dangerous. Pradyumna has endeared himself to me with his support of women. Pradyumna smiled at Maya, knowing that this was just the beginning. Women such as those who had assembled here would provide the stability that the world needed in order to survive. Dharma could not win if half of humanity was denied their rightful place. The warrior wondered if he should run, escape to his own world. But where could he hide from the god of gods? Even if Shiva let him flee, would he be able to live with himself after he had failed so miserably? Did he want to be known as the leader who could not lead, the redeemer who could not redeem his people? Do all your actions as a sacrifice for the greater good, said Krishna’s voice in his head. He saw Shiva raise his trident. Fear nothing, fight for dharma and you will conquer, the voice said again. The cover of the book is beautiful and once I started reading the book, I got transported back to the days of the Mahabharata. The writing and descriptions are such that it was very easy for me to picturise the entire scene and the set up. Most of the scenes are set in the battlefield, with vivid descriptions. One example, "Their maces descended like lightening and clanged like thunder in a contest of will and skill". I read the interaction between Shiva and Pradyumna five times, it was so well w The cover of the book is beautiful and once I started reading the book, I got transported back to the days of the Mahabharata. The writing and descriptions are such that it was very easy for me to picturise the entire scene and the set up. Most of the scenes are set in the battlefield, with vivid descriptions. One example, "Their maces descended like lightening and clanged like thunder in a contest of will and skill". I read the interaction between Shiva and Pradyumna five times, it was so well written. While reading the interaction between Pradyumna and Yama, I was waiting with baited breath, as to who would win. The peace time conversations between various members of Krishna’s family show the love that they have for each other. The way the family tries to protect Vajra, Pradyumna’s nephew has been described well. Maya’s support to her husband and his family has been beautifully documented. The language is simple and the book is well paced. The extensive research done is reflected in the way the story flows and it was very difficult for me to separate the fact from the fiction. Hats off to the author for thinking on a different plane because for most of us, the Kurukshetra war ended at the battlefield. The characters have been created in such a way that when I was reading about them, the seemed lifelike to me and the pictures of Amar Chitra Kathas that we read as kids came to life. The scene when Pradyumna and members of the Pandava and the Kaurava families see their dead ones has been written with so much of feeling, that it brought tears to my eyes. What was surprising that even though the author has written the story in such a way that even though the story moves from one setting to another and even from one time zone to another, the writing is such that I did not lose track of the book. I have read Usha Narayanan’s first book, ‘Pradyumna - Son of Krishna’ and immensely enjoyed it. This one is second in the series. While the first deals with the birth and beginning life of Pradyumna, this one tells us the story post the Kurukshetra war. An avid mythology reader knows Mahabhartha, so the unexplored life story of Pradyumna after the war and the revelation at the end is fascinating and entertaining. When you get to review a book penned by an author whom you admire a lot, to read the book and review it becomes a joy. The Secret of God's Son is one such book which will not only remind you of our great heroes and how they became a hero through their trials and tribulations but will also keep you grounded and away from vanity, especially when you read about the Achilles’ heel that every hero from our past had. Such narrative not only make you take pride in our literature but also reminds you that no one is invincible and every hero had to remember this to achieve great heights. ​Ms.Narayanan’s The Secret of God’s Son introduces Pradyumna, the son of Krishna, in his pacifist avatar who eases into his destiny as the story progresses. Along with his wife, Maya, he not only is a propagator of self-righteousness but also believes in solving most of the issues without resorting to violence. But his half-brother, Samba, who is the augmenter of the Kali yuga, would not let him live in peace. Pradyumna might be a peace-loving man, but when it comes to protecting his family, his real persona surfaces to fight back. Watching actors acting in the serial and painting the scene of The Mahabharata is something most of us are used to. But to paint that same scene with words is not a small feat. To some of us, what are folklore and stories becomes a way of life to many Indians. The nucleus of our culture. Many incidents in this book will tell you where certain thoughts and culture has its roots from. Maya, in this part of the series, is not just a shadow of Pradyumna but becomes the voice of the future generations of women. Why did Sita tolerate such injustice and why did Draupadi have to bear such a heavy cross of obliterating a whole clan? Why was the responsibility of continuing a saga lying heavily on the shoulders of a woman? Beautiful thoughts that satiated the feminist in me. There is no doubt that a lot of research that has gone into this book. And not only research but also analysis. This book is not just a fiction of what the author thinks could have happened. Nor a make-believe world where Pradyumna, like Shiva in Amish Tripathi’s novel, is born to be a man. But questions like why Ravana was born as a nemesis of Rama and Samba of Pradyumna. Each character was following the Karma Chakra, unknown to them – they all played a role in welcoming the Kali Yuga. Gandhari’s curse which seems so dominant in the beginning of the novel is but a small drop in the ocean of tales that this novel brings to a reader. As the story progresses, there were many times I raised an eyebrow thinking I can prove Ms. Narayanan wrong in her research. Ah, that’s the small game I always play with myself. Thanks to ‘google chacha’, there is nothing you cannot find on the net. Except for one. Who exactly is Pradyumna’s? Kama? Vama? Or…? I am still getting goosebumps in the analogy that Ms. Narayanan has drawn regarding this. A must read only to understand this fact. Maya definitely tops the list of my likes in this novel. The warrior princess. The woman who was the real ardhangini of Pradyumna. A woman on whom the future generation can look up to as a role model. How many of us can truly say that Sita or Draupadi are our role models? I have no intention of walking on the fire pit just to please my husband and ah well Draupadi .. ah well. But Maya has that oomph factor. The fiery princess who can face any challenge. Pradyumna and Samba form the perfect good vs. evil in this part of the series. And for once, I saw Krishna as a human. A father caught between two sons. A beautiful thought. But yes, if he could have turned Samba into a lizard, many problems could have been solved. When I received my copy of the book I could not stop but tear open the package, being an admirer of the Lord Krishna, for me it was no ordinary book. I got some positive vibes from the miraculously simple yet mysterious cover and wondered what is it going to unfold? The beauty of the cover thrilled me so much that I ended up Bookstagramming about it which was indeed loved by my dear followers. When I started reading - "The Secret of God's Son" by Usha Narayanan, my first reaction was "Oh my God!" When I received my copy of the book I could not stop but tear open the package, being an admirer of the Lord Krishna, for me it was no ordinary book. I got some positive vibes from the miraculously simple yet mysterious cover and wondered what is it going to unfold? The beauty of the cover thrilled me so much that I ended up Bookstagramming about it which was indeed loved by my dear followers. 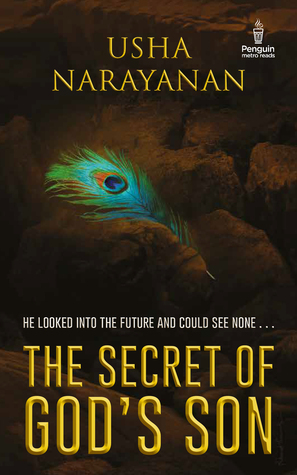 When I started reading - "The Secret of God's Son" by Usha Narayanan, my first reaction was "Oh my God!" There were sentences which were too boldly bringing to light what we had read in our childhood in the pages of "Mahabharata", only in a "censored" language. I have been shocked, amazed, thrilled, petrified and fallen in love with Usha Narayanan's play with words and her inauguration of the character of Krishna's son, Pradyumna in the Pages of her book. The tale is about Pradyumna and his struggle to reverse the dire prediction by Gandhari, given unto the land and the tribe of Krishna. You can read the blurb at the Amazon site, link is attached below. For now, give your attention to my review. I want to make justice to this amazing novel but I have half a mind that says I will fail to do it. I feel a bit sorry for myself for not having gone through the first book of the series which leaves me puzzled if I missed out on any piece of joy to be delivered to me while i read the second book. In my humble and unbiased opinion, I believe that no other book based on the mythological genre that I read in this year can surpass the exuberance this one brought to me and I am glad to have laid my hands upon this. Speaking about the progress of the story, I have been charmed by Pradyumna's grace and I am pretty sure if you get your hands on the same, the characters from mythology , or rather, beyond the mythology had an aura of realism and magical force that compel you to march along with them. You feel an intangible desire to follow-up with the characters and know what happens next. I was impressed with Pradyumna's persistence and his courage in himself. I was charmed by his wife Maya, a devoted lady whose subtle yet daring nature was enough to steal the limelight. Reading this book was like watching the events and their detrimental occurences which lived upto my expectations. The style of narration did the justice to the plot and Usha Narayanan has made one of the best creations in the field of Mythology, ever. Overall, if you are a fan of good Mythology or are willing to give this new genre a shot, buy this book by clicking here. I rate the book 4.5 stars. Pradyumna son of God Krishna is worried of the Gandhari' Curse. He Seeks help from God Shiva and gets his Trishul to bring back Vikarna from Yamloka. But Gandhari can not revert her curse; dissapointed pradyumna does not lose hope and continues struggles to decrease the effect of Gandhari' curse. And there is one powerful weapon still-the secret surrounding his origin. Will he uncover it in time to fight off the cataclysm? In the answer lies the destiny of all humanity! Usha Narayan is back with one more mythological story after successful Pradyumna. Usha Narayanan had a successful career in advertising, radio and corporate communications before becoming a full-time writer. She is the author of several books including The Madras Mangler, a suspense thriller and Love, Lies and Layoffs, a light-hearted office romance. The Secret of God’s Son is the sequel to her bestselling book Pradyumna: Son of Krishna which was published in 2015. When she’s not juggling writing, editing and interviews, Usha reads everything from thrillers to romances, provided her cat isn’t fast asleep on her Kindle. The book includes many small stories from the Great Epic The Mahabharata. And it is impossible to reach the level of Rhishi Ved Vyas, the original writer of The Mahabharata. But author has tried to put the part of the great epic in simple and novel form to readers. Pradyumna and Gandhari's curse centred story neither lose flow nor leaves the subject. The author has successfully pictured the protagonist -Pradyumna without affecting image of other characters. Maya the wife of Pradyumna emerges as an important character in the book. Story continues smoothly, with added interesting small stories of God Krishna and God Shiva. Average reader might will have difficulty to understand few words used by the author and that may affect the interest in reading of the book. Till yet the book does not let go away the reader because of the strong plot full of twists and magics. Cover page is interesting and attractive. The book could have at higher level if the author would have written better words at some places in book. The book is really good read, but it is not comparable to Mythical book available in verbal language. If you have read Pradyumna: The Son of Krishna then this book will be a natural flow of it. However that doesn’t mean that this book can’t be a standalone read. Usha Narayana has the gift of putting something so complicated as the different births in the different yugas as well as the reincarnations into an easy read and natural understanding. I won’t dilly-dally with what the book is all about, but yes there are certain messages that I am taking the liberty of extracting from the book. I think, If you have read Pradyumna: The Son of Krishna then this book will be a natural flow of it. However that doesn’t mean that this book can’t be a standalone read. Usha Narayana has the gift of putting something so complicated as the different births in the different yugas as well as the reincarnations into an easy read and natural understanding. I won’t dilly-dally with what the book is all about, but yes there are certain messages that I am taking the liberty of extracting from the book. I think, Usha too might have wanted to convey those. The book is about hope. It does espouse faith in the future. The book gives hope, taking the trials and tribulations of Pradyumna as examples. When the world says give up… Hope whispers, “Try one more time”. The book talks about love. Love that transcends yugas, beyond the realm of the world and infinitely strong. It talks of love that is beyond the boundaries of time, space and gender. Gender? Yes! The love of Maya and Pradyumna, Krishna and Radha, Rukmini and Krishna, Shiva and Vishnu (Hari-Hara) are all very beautifully conveyed. The 3rd element that the book comes forth with is the vanquishing of darkness, evil and the Kaliyug. There are subtle hints of how to overcome them. Not by force alone but by intellect too. While the world waits for Kalki to turn Kaliyug into a Golden age again – there are many personal demons that we need to fight. There are many evils to be vanquished and the efforts aren’t in vain. The struggle maybe long but perseverance is the key. Beautiful messages that I have extracted from this book that’s well written. Simple to read and easy to follow. I also recommend that you read the first book “Pradyumna: The Son of Krishna” by the same author and also Shikhandi by Devdutt Pattanaik to understand the different aspects of love. God’s son; One might wonder who?? Till date all have heard and read about the great Mahabharata war and its aftermath. But no one has written about what happened to Krishna and his clan after the war? What happened to Gandhari’s curse on mankind? People have read scriptures; novels and serials are made which depict till the end of war and on Pandavas but what happened to Krishna and his family and to his glorious city Dwaraka. Did Gandhari’s curse bring evil end to mankind? The Secret of God’s God’s son; One might wonder who?? The Secret of God’s Son is a Sequel of Pradyumna Son of Krishna (which even though I have not read but I didn’t feel anything amiss). After the great war of Mahabharata, while all Pandavas and people of Hastinapur were trying to get back to normalcy, Krishna and his family were reeling under fear of Gandhari’s cruel curse. Krishna, the Dark Lord, the Saviour was cursed. Not only his life but the existence of whole mankind was in danger. In this time of crisis it was up to Krishna’s son Pradyumna to save his father, his guru, his mentor along with his family and entire mankind. But along with this quest he also had a task of unrevealing a secret. A secret of who he was, his true identity, the true reason of his existence on earth was yet to be revealed to him. Yet another well scribed mythic-history story. The language is lucid and the book is quite well paced. The way the story flows portrays the extensive research done by the author. Though this book is a sequel of “Praduymna the God’s son” but still without reading the first one I never felt at loss. In fact I hardly knew anything about Praduymna and Samba. The story is so engrossing that it glued me to the book till the end. Enough of my experience, let’s go to the story. This story is not about th Yet another well scribed mythic-history story. The language is lucid and the book is quite well paced. The way the story flows portrays the extensive research done by the author. Though this book is a sequel of “Praduymna the God’s son” but still without reading the first one I never felt at loss. In fact I hardly knew anything about Praduymna and Samba. The story is so engrossing that it glued me to the book till the end. Enough of my experience, let’s go to the story. This story is not about the Kurukshetra War but on the aftermath of the Kurukshetra War. The Great War has been fought and won by the Pandavas but is there any winning side? Can anyone be happy after such great losses? Both Pandavas and Kauravas are devasted and here begins the tale told by Usha Narayanan. The Secret of God's Son: That one book which brings together every little thing that I am in love with - Usha Narayanan, Penguin Publishers, A beautiful cover with a peacock feather, and a heartwarming story. A quest to find the 'Secret of God's Son' and that would change the destiny of humanity -- said the blurb. What had happened? The minute I started it took me back to good old days when my grandma would narrate stories from the Mahabharata. More than the novel, I love the 'writing' style and t The Secret of God's Son: That one book which brings together every little thing that I am in love with - Usha Narayanan, Penguin Publishers, A beautiful cover with a peacock feather, and a heartwarming story. The minute I started it took me back to good old days when my grandma would narrate stories from the Mahabharata. More than the novel, I love the 'writing' style and the language more. There are beautiful phrases that give goosebumps for the word choices. And there is one powerful weapon still -- the secret surrounding his origin. Will he uncover it in time to fight off the cataclysm? In the answer lies the destiny of all humanity! The book is something different and totally worth a try. It has everything which the books written today lack. A precise portion of everything is well maintained by the author and I thoroughly enjoyed the new tales of post Mahabharata. Usha Narayanan's books have shown that her writing transcends genres. This book shows beyond doubt that mythology is the genre which is her forte. "The Secret of God's Son," reads like an interesting novel but on close observation one can see the spiritual wisdom imparted therein. This book is a keeper both for its readability and for its value. The Secret of God’s Son is a sequel to the book,Pradyumna-Son of Krishna. This books has lived up to the expectations of the prequel. The language is simple and lucid but the philosophical points underlined in the story are heavy with meaning to be pondered well. The revelation at the end of the book was unexpected but good. Overall a thought provoking read. As a mythology genre lover , I enjoyed reading this book, which is a sequel to the highly acclaimed book Pradyumna son of Krishna. Cover of the book is beautifully designed to match the story of the book . Story starts with the mankind plunged into darkness by the curse of queen Gandhari. It is up to Pradyumna, the son of lord Krishna to save the world from the evils of Kali Yuga & also save the teachings of lord Krishna . He is well supported by his loving wife Maya . Their love for each As a mythology genre lover , I enjoyed reading this book, which is a sequel to the highly acclaimed book Pradyumna son of Krishna. Cover of the book is beautifully designed to match the story of the book . Story starts with the mankind plunged into darkness by the curse of queen Gandhari. It is up to Pradyumna, the son of lord Krishna to save the world from the evils of Kali Yuga & also save the teachings of lord Krishna . He is well supported by his loving wife Maya . Their love for each other is limitless . Pace of the book is well maintained . The author has done pretty good research for her book . Characterization is beautifully done by the author . The plot has many twists & will have the reader mesmerized. Not as good as the last one! In fact, I wonder why this sequel was written! Nevertheless, for those who love mythology it is still a good read. Usha Narayanan had a successful career in advertising, media and corporate communications before becoming a full-time author. She has written 'The Madras Mangler', a suspense thriller, and two romances, 'Love,Lies and Layoffs' (Harlequin) and 'Doctor Stalker Spy' (Juggernaut). Her mythological bestsellers from Penguin include 'Pradyumna: Son of Krishna', 'The Secret of God’s Son', 'Prem Purana' an Usha Narayanan had a successful career in advertising, media and corporate communications before becoming a full-time author. She has written 'The Madras Mangler', a suspense thriller, and two romances, 'Love,Lies and Layoffs' (Harlequin) and 'Doctor Stalker Spy' (Juggernaut). Her mythological bestsellers from Penguin include 'Pradyumna: Son of Krishna', 'The Secret of God’s Son', 'Prem Purana' and her latest, 'Kartikeya and His Battle with the Soul Stealer'. She combines self help with mythology in 'Awaken the Durga Within', a Rupa release that is now rocking the charts. When she’s not juggling travelling, writing and interviews, Usha reads everything from thrillers to romances.